I want to be a paperback writer….paperback writer…. About a year ago, I entered a short story in a contest put on by John Michael Greer, author of The Archdruid Report, (link in the sidebar) He had been hugely influenced by reading science fiction as a kid, and wondered about the visions for the future that are part of pop culture. It is something I worry about- there are many middle grade novels depicting distopian futures where kids kill each other, or teens are dismantled for spare parts, or teens fall in love with sparkly vampires. I guess the sparkly vampire one is a distopian present. 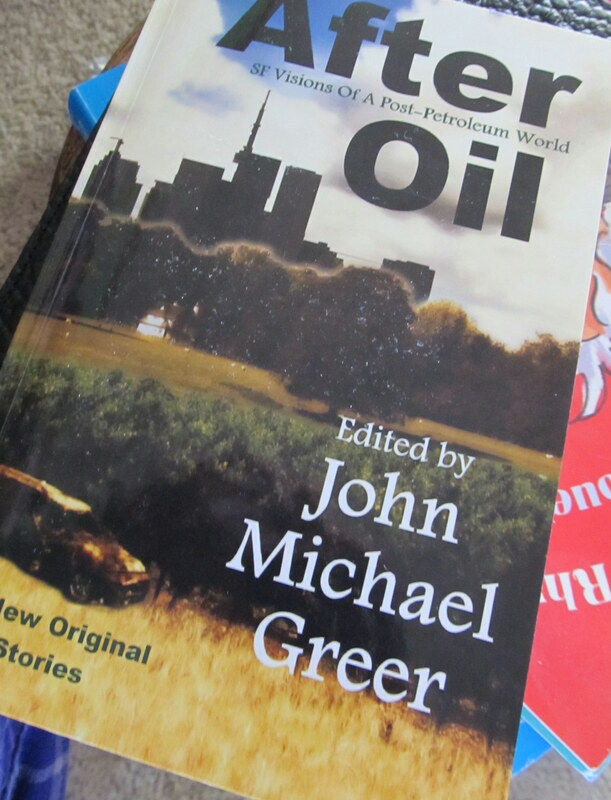 Greer asked the question: what would the future look like once the oil runs out? So, I envisioned a time around 80 years in the future, in the old age of a woman born in this “final year” of the Mayan calendar, and a young family who comes to live with her. There are no zombies. Sorry. I’m proud of my own story, but now that I’ve read all of them, I like all of them. Still no zombies- but alternative histories of potential civil wars, and small-town justice, and climate change. My favorite is “The Going,” which depicts the tough choices families have to make about medical care and letting go. It’s very moving. I confess that promotion is tough for me- I told very few people that I entered the story, told one or two that it had been selected as a winner, just a couple that I had signed a book contract. Now, I’m telling you all, and here’s where it’s awkward…here’s where I’m supposed to seal the deal and tell you to buy the book. Um…buy the book. Please? If you want. CONGRATULATIONS!!! I LOVE that you entered and got selected. Its awesome!!! !